Contains soothing Lavendar and reverent Sandalwood. Help ease younger minds into the magical realm of sleep world. Badger Balm is loved around the world. Night-Night Balm is made to help ease younger minds into the magical realm of the sleep world. For this special child-friendly formula, Badger Balm chose essential oils that are known to be good for children and are also known to promote feelings of safety and calm. Chamomile helps children to calm down and unwind from nighttime activities, lavender helps children to relax and feel soothed, while sandalwood instills a feeling of reverence. Mandarin and spearmint help kids feel safe and uplifted. Rub a little onto temples, neck, lips, wrists or anywhere that will help to diffuse the wonderful aroma into the air around the child. 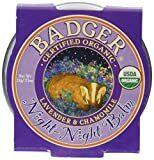 This entry was posted in Organic Health Products and tagged Badger, Balm, Calming, Certified, Dream, Kids, Night, Organic, sweet by Organic Health. Bookmark the permalink.